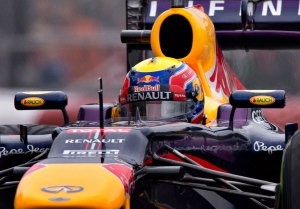 MONTREAL -- A race-track worker at the Canadian Grand Prix was killed Sunday after he slipped under the wheel of a crane at the end of the Formula One event. 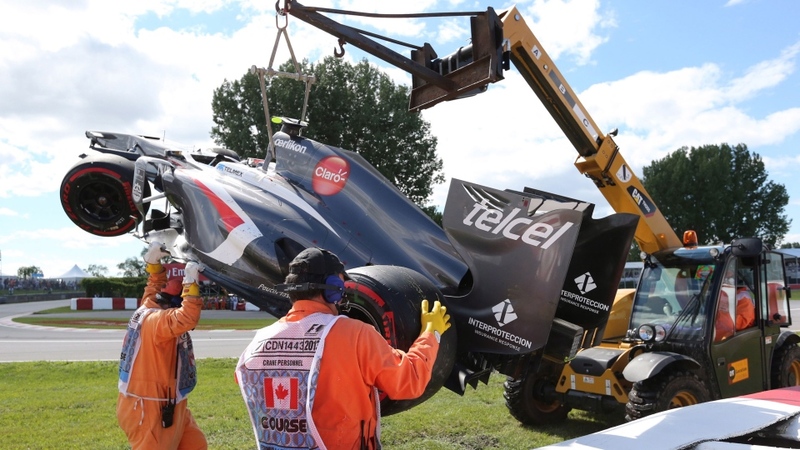 Officials said the man was escorting the crane as it moved Esteban Gutierrez's Sauber car, which did not finish the Montreal race. The accident occurred shortly after the checkered flag waved to signal the end of the race, a major weekend sporting event for the city that draws hundreds of thousands of fans to Circuit Gilles Villeneuve. "The recovery vehicle had lifted the car to return it to the pits, and while doing this, the worker dropped his radio and attempted to pick it up," Matteo Bonciani, F1's head spokesman, said as he read a statement to reporters at the track. "As he did this, he stumbled and was hit and run over by the recovery vehicle." The man, in critical condition, was airlifted to Sacre-Coeur Hospital by helicopter after being stabilized by race-track trauma nurses. "Unfortunately, the worker succumbed to his injuries at the hospital," said Bonciani, adding that organizers wanted "to communicate their deepest condolences to the family and friends of the victim." Officials would not immediately release the identity of the victim, but said he was a member of the Automobile Club de l'Ile Notre Dame. Hospital officials said in a statement that he was a volunteer at the track. "It's terrible," said a visibly shaken Francois Dumontier, the Grand Prix's promoter. "It tarnishes the superb weekend that we had. I am devastated to learn this, I don't have any other words." Gutierrez tweeted about the incident from his verified Twitter account: "My dearest condolences to the family of the marshal who lost his life today, our prayers for him & his family. RIP." Earlier Sunday, Dumontier said the crane operator couldn't see the man when he hit him. "Unfortunately, the vehicle's wheel passed over his body," he said before the worker died in hospital. The event's chief medical officer said a physician, who happened to be nearby when the accident occurred, rushed to the injured worker. The man was still conscious when the doctor arrived at his side, he added. "He went there within 30 seconds (and) started stabilizing him," said Jacques Bouchard. He said trauma workers at Circuit Gilles Villeneuve treated the worker enough to have him taken to hospital by helicopter. He was declared dead a few hours later. Bouchard said the worker, about 38 years old, had been working at the track for 10 years. He said the man was walking with the crane to help stabilize the Sauber car, as it hung from a cable. This wasn't the first death at a Canadian Grand Prix in Montreal. In 1982, Riccardo Paletti, a rookie driver for the Osella team, was killed when he slammed into Didier Pironi's stalled car on the starting grid. Other F1 events have also witnessed deaths on the track. A marshal was killed at the 2001 Australian Grand Prix when Canadian Jacques Villeneuve's BAR Honda car leapfrogged another car and flew into a concrete retaining wall. The crash sent all four tires and other debris across the track and into a fence. Only six months earlier, a fire marshal at the 2000 Italian Grand Prix died when he was struck by a wheel thrown from a multi-car pileup on the first lap of the race. In 1977, at the South African Grand Prix, race marshal Frederick van Vuuren died in the same incident that killed driver Tom Pryce. Van Vuuren had run onto the track to attend to a stalled car when he was struck by Pryce's car. The fire extinguisher he was carrying flew out of his hands and hit Pryce in the head. Other Canadian cities have also had racing-related deaths. At the 1996 Toronto Molson Indy, an official died in the same crash that killed rookie driver Jeff Krasnoff. Another track official was killed at the 1990 Vancouver Molson Indy when the car he was pushing on the track was rammed by another car.